When you are pregnant for the first time, everyone warns you how fast they grow up, yet you still find yourself wishing away the days and longing for the next milestone. I loved the first few days, but I was in an adrenaline haze and they flew by. Before I knew it, my little baby was sitting up, eating solids and showing off his cheeky personality at every opportunity. This time I am determined to enjoy every single precious moment, because I know how fleeting the newborn days are. I still find it hard to believe that a whole month has gone by since that wonderful day when I met my beautiful little boy for the first time but I have been trying to enjoy and capture every single day. 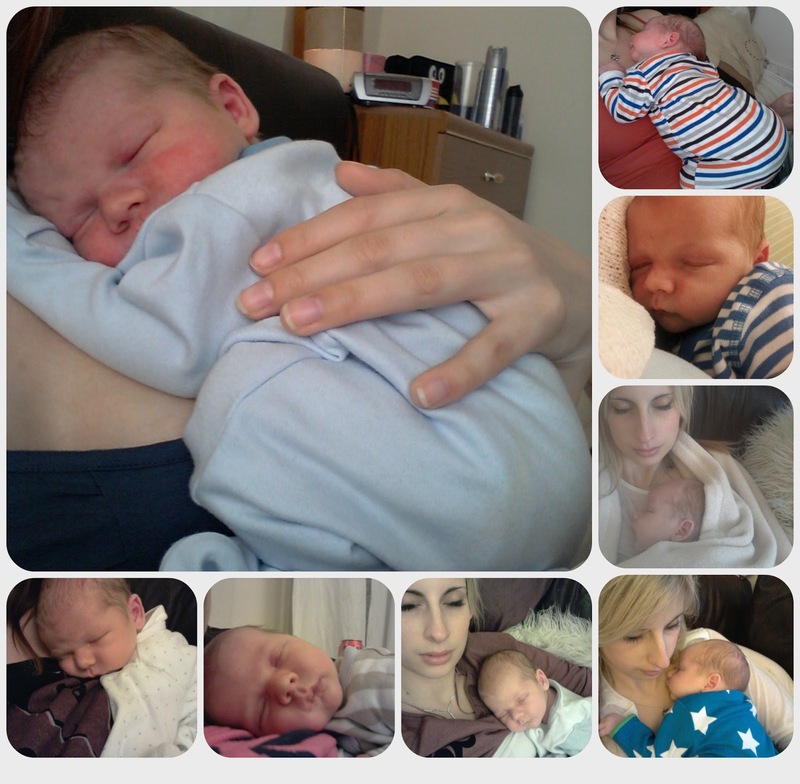 Despite knowing the advice, I have let Archie nap on me when he wants to (which is pretty much all the time!). He may form bad habits but in my opinion there is nothing more precious than curling up with a sleeping newborn snoring away on your chest. He is my little hot water bottle and we are both happiest snuggled up together. Our cuddles are limited due to an energetic toddler and his busy social life so I really make the most of the ones we do get. Our baby bath is sat on the bathroom floor unused, as Archie has shared all of his baths with me. I love the excuse for skin to skin which we don't get many chances for with the cold weather and he is so relaxed lying in my arms in the warm water. It won't be long before he is sharing his baths with his big brother, splashing away and singing the penguin songs, so I am enjoying the extra quiet time together whilst he is so small. It won't be long until Archie is in jeans and T-shirts looking like a real little boy, but for his first month we have chosen to keep him in comfy sleepsuits (apart from his red nose day outfit). I love him looking like a baby and whilst he sleeps all day (or is meant to), pajamas seem like the best choice! We are introducing some little outfits now too, but staying with soft and cosy as I know I will have plenty of chances to dress him in trendy togs when he is bigger. I may be over enthusiastic with my camera phone, but not a day of Archie's life has gone by so far without a photo being taken, Every day he amazes me with his beauty and I want to remember the moment. The first time Dylan held his hand, the first time he wore a hand knitted cardigan from Nanny, the first time he fell asleep snoring with his mouth wide open - each moment precious and perfect and eternally recorded to terrorise him as a teenager. These newborn days go so fast and as I watched my 4 week old baby boy roll over this week I remembered exactly why I am trying so hard to slow down the time. Every milestone is precious, but every ordinary day is equally so. I can't wait stop taking pictures of my little charley and hes now 10 months and i ask my self where did time go. Have followed your blogg and a few others for a while and have finaly decided to start blogging my self only took over 10 months to do this. I decided that its a birilliant way to capture those memoryes and pictures are also such and imporant part. You sound exactly like me and now my boy is 6 months old. Makes me want to cry sometimes!